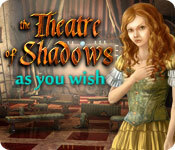 Theatre of Shadows: As You Wish is rated 3.8 out of 5 by 101. Rated 5 out of 5 by locojet from another one i missed !!! this is another great game for puzzles. lots of them. even though this game came out in 2012 i enjoyed it as much as the new ones with all the morphing and other bells and whistles. just a straight forward adventure/puzzle game with a hogs not 30 plus like some games. i would say more puzzles than hogs. . Rated 5 out of 5 by hevensday from The best story and mini games First of all, I love Vogat Interactive. I was impressed the most by the storyline. It has the best story of any game I have ever played. I hope I am not spoiling anything by saying the moral of the story is to be careful what you wish for.The mini games are fun to do, so they aren't difficult, but they do require thinking. The games are different from the norm (sliders, random clicking, etc). The mini-games in this game require logic, spatial knowledge, or assembling mechanical components. 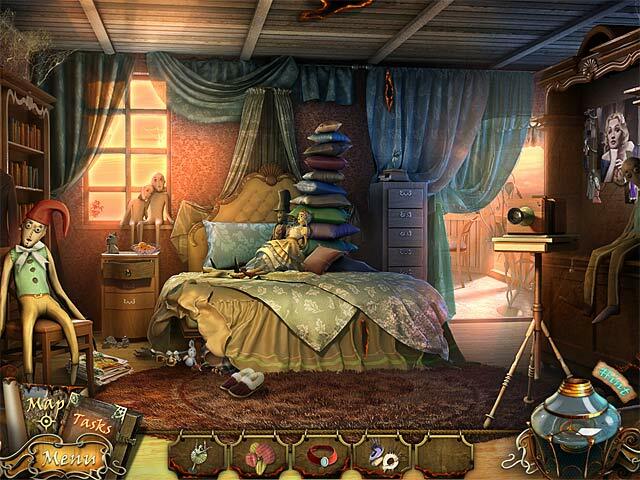 I have played many games such as Mystery Case Files, Mystery Trackers, Enigmatis, Nancy Drew, etc. I love them all, but this one has the best story. Love it! Rated 5 out of 5 by agbosche from Hours of fun! This game went on and on. I enjoyed going from scene to scene and trying to figure out what to do. The map is helpful by giving you an idea where you need to go. i managed to actually complete most of the puzzles without skipping them. I recommend this game. Rated 5 out of 5 by aysgu from LOVED IT, LOVED IT, LOVED IT... Get this game, it's long, it's fun and it's definately worth every penny!!! Loved it. Rated 5 out of 5 by janniemst from My new favorite game I enjoyed this game so much! I don't know how long this game actually is because I took my time playing it over a period of 4 days. But, for me, it was a long enough game. There are enough areas to keep it interesting and a lot to do. The mini games are fun and I only skipped a couple of them which were the "boring" ones. Other reviews go into more of what is in this game so I won't go into all of that. I just want to put my comments down of how enjoyable this game was for me...I will play this again for sure! Rated 5 out of 5 by Kelly01010 from Challenging, yet fun and addictive This game is quite unique. It contains more puzzle than HOS, which is what I prefer. I played this game without hints and/or skips and I was stumped a few times. The use of items from your inventory is not always clear. This game makes you think carefully about how to solve it. Addictive, because I love the puzzles. If you want a challenge, I suggest you give this game a try. Rated 5 out of 5 by swampie from Catch those sales. Other players have adequately and thoroughly reviewed this gem by VOGAT. I am here to agree with the players who liked this game. Got this one and two others by this dev in the football Sunday sale. Like all three. My two cents. Rated 5 out of 5 by TheMagus84 from Finally an ADVENTURE HOG. This game is great. I'v been getting tired of HOs but still enjoy them in moderation and this game has the perfect amount of HO scenes. I'v been playing for just over an hour and have only had maybe 3 or 4 HO scenes. This game is more about figuring out what to do and mini games, rather than searching junk piles for hidden objects. It's a very linear game too. Which is sometimes a bad thing when it makes a game too easy and boring, but its done really well in this game. When you find a puzzle you need an object for, you usually find the object shortly after. Or vice versa. Each scene/area and it puzzles are usually completed before entering another scene/area. A great game for relaxing with a little challenge. The puzzles are sometimes really easy, sometimes medium difficulty. I haven't come across a really hard one yet. Which I'm fine with right now. Sometimes I want a really difficult challenge, sometimes I just want to feel like I'm accomplishing something, even if it's easy. :) It isn't a very dark game, despite the dark villain. The graphics aren't the perfectly crisp, clear computer generated kind, but I think it gives it character. Everything is clear enough to see without squinting. The story is ok. Not that great. Maybe its just me, but it didn't really grab my attention. I'm still enjoying it though. Perfect game for this half off sale, but it would still be worth it at the full price. Rated 5 out of 5 by consciousnut from Beautiful & very enjoyable game!I I haven't enjoyed the experience of playing a game in such a long time! It was longer then the games I've been playing lately but I loved every minute. Some scenes just took your breath away. The graphics and imagination used for this game were beautiful.I would love to have alot more games that draw me in the way this one did. There were stupid parts of the story, but I didn't even mind because there was so much to keep you occupied. The creators deserve a great yahoo for this one as far as I'm concerned. Rated 5 out of 5 by voodoogueen from Be Careful What You Wish For! Despite a few flaws, I though this was a fine game and I had a great time playing it. The animations are a little blurry but the static scenes are clear and very beautiful. 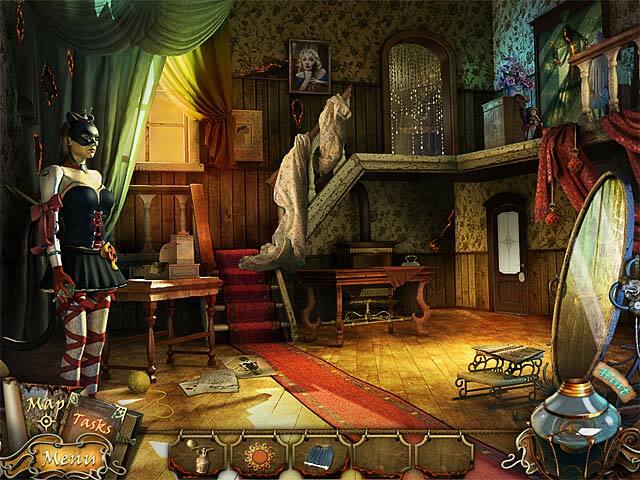 A few items are poorly described in some of the hidden object scenes, especially near the end of the game. You have to advance the story by clicking on a dialog box and the music is overly melodramatic in places. However, there is a great variety of puzzles driving a terrific story and that made this game well worth the price of admission! 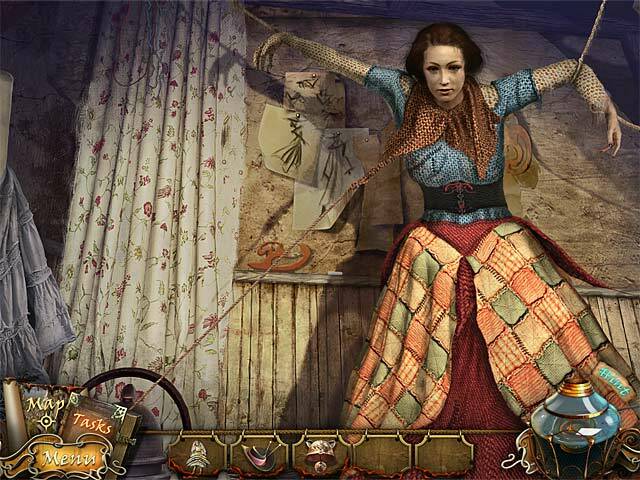 Most puzzles require you to find pieces to open them, either by exploring scenes or earning them in hidden object scenes. I loved that! There is a nice variety of well developed locations and characters. Loved that too! So maybe it was a little rough around the edges but I had a great ride and I hope you do too! Become a Hunter of darkness to cope with possessed owner of theater and revived shadows. Help other people by correcting their wrong fulfilled wishes!